I. Kirk/Shatner speaks to the Providers: "Name your price on Priceline!" "I bid 300 quatloos for the newcomers!" "I bid 1000 doubloons they're untrainable!" "Six million bucks they'll have to be destroyed!" Art of the deal . . .
II. 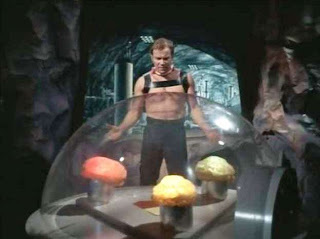 My Mom, riffing on an older post about Cyber-addictions, suggested this Star Trek episode from 42 years ago . . . Kirk representing today's human beings and the Providers presaging Future "people" . . .
III. Nod to the North Carolina band Bad Checks who in the mid-1980s put out a wicked song called "No Time Like the Future." And let's not forget Zager and Evans' bizarro 1969 hit pop song, "In the Year 2525 (Exordium and Terminus)." As for me in the here and now, I'm plenty happy with the rolling present . . . how about you? People used to tell me that I was in the wrong time-- that I should have been in the sixties. To be sure, I was influenced growing up in the sixties, but I think I belong, to paraphrase Jesus Jones, right here, right now. I HAD forgotten that song. Now I want to hear it again...Thanks for reminding me! Couldn't pass up a Star Trek reference. I remember this episode well. I remember there was a woman in silver. Erik, I remember when I used to hear that Z and E song and change the channel. It totally freaked me out! My girlfriends would turn it up and I'd cover my ears! I am happy in my world!